Port Boca Grande Lighthouse and museum are located on the south end of Gasparilla Island. They are on the grounds of Gasparilla Island State Park. The lighthouse was built in 1890 and was restored to close to its original condition in 1999. It is the oldest structure on Gasparilla Island. The lighthouse museum has five rooms, with three of them covering the social and cultural history of the area from 12,000 B.C. to present times. The fourth room is a "please touch" area where you can examine local bones, fossils, and shells. The fifth room is a gift shop with souvenirs, artwork, and jewelry. When you buy something from the gift shop the proceeds go to the museum to help support the lighthouse. One of the nicest things about visiting this lighthouse are the gliders on their porch where you can sit and enjoy the beach and the sounds of the sea. 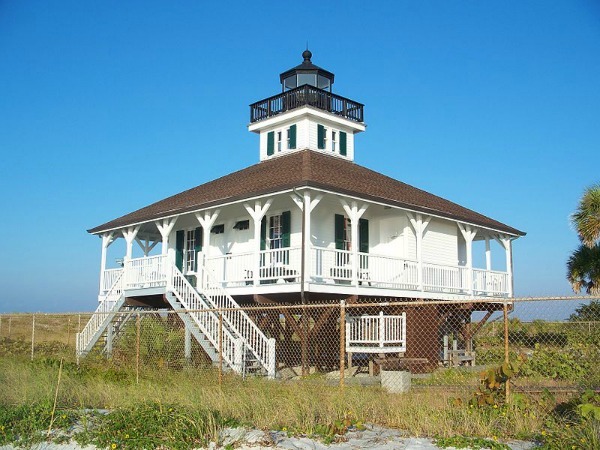 The lighthouse and museum are in Gasparilla Island State Park that is open from 800am to Sundown 365 days a year. Admission fee to the state park is $3.00 per vehicle, $2.00 for pedestrians and cyclists. An honor box is used so correct change is required. Closed entire month of August and major holidays. There is also information on restaurants and lodging in the village of Boca Grande elsewhere on our website.